Discussion in 'Android Devices' started by Arhtard, Oct 24, 2011. This is for the Samsung Gravity Smart T589. 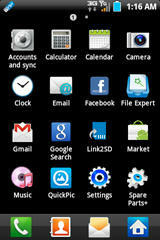 This is a stock 2.2.2 froyo rom that is deodexed and themed. See post #2 for a odex'd non rooted version. This was built from a system dump - the firmware hasn't been released yet. Please note that I am not a developer - just a tinkerer. This will be installed by flashing through the stock recovery. There are no custom recoveries available yet for this device. This has the majority of the bloatware removed. 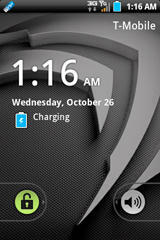 It will utilize the stock kernel already in the phone. The ROM download link is provided after the screenshots. Removed many ringtones and added a few. Removed Startup sounds and Shutdown sounds. Removed Startup and Shutdown animations. One for maximum events per second and the other two for sounds. The default ringtone is from the movie "Crank" - the fading in and out phone tone. The default notification sound is "Tinkerbell" - lol. Added a custom boot animation - blue coin. Added Sd Card speed tweak + battery tweak. Themed several icons through the IC Menu. Themed the framework to a black "Sense" theme. This device has very little internal space, so I have included Link2Sd app. - first partition will be created as a <FAT32> <Primary> partition. - second partition will be created as a <Ext2> <Primary> partition. This phone seems to operate best when the CPU frequencies are set to 320 min and 800 max. We can't overclock the phone until a kernel is developed. Samsung hasn't release the kernel or firmware yet. Download No Frills Cpu from the market and set the frequencies to those specs. The phone is defaulted to 245 min and whatever it needs up to 800.
it really adversely effects battery performance. robertchatty, cstanley, tel001 and 15 others like this. well done sir. Can't wIth to give this a shot. Wow, just in the nick of time! I boot looped my wife's phone and was able to get it back up and running (better than ever) using this thread. Thanks so much!! If I want to have some of the extra apps on there when I install the ROM, can I just unzip your zip file, add them to the system/app folder, rezip the folder, then load it to the sd card and start the process? Sounds simple enough, just wanted to make sure. the "update.zip" file is "signed" so <NO> you can't do it that way. you have 3 ways to do this. 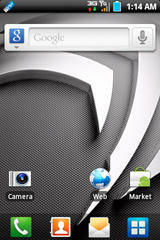 I ended up just installing the ROM and getting a few of those apps from the Market. I was a bit nervous last night when my wife went to bed and I told her I'd get her phone running smooth, only to mess it up and have it not boot. By the time she woke up all was back and she was only missing a few contacts. Phew! I couldn't have done it without this, again many many thanks. It's a major improvement over the stock phone. this one is cool. but im afraid i cant do it for my phone, cause im not that a good manipulator, if thats the word.. can somebody try to explain this to me simpler? How in the world did you get Flash in this rom? Is this the only way we can get it for this phone? Right...now any chance we can get Flash updated to v11? Still can't watch a bunch of of videos on sites like YouTube and Vimeo. I installed this rom. No issues there. Perfect directions. For some reason I no longer seem to have GPS function. I use the google maps navigator quite often. It just says searcing for GPS signal or something along those lines. Even downloaded a couple of apps that give GPS info and they show nothing. I used to have that little satellite icon in the top status bar and now there is nothing there. Nevermind. I turned off GPS. Powered Down. Removed the battery and let it sit for about 5 mins. Put it all back together and now its working. Whew. Thought I broke something. I installed the ams zip file today. All is well except my phone will not find the sd card. Any ideas??? Thanks. 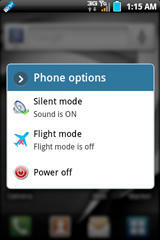 you will have to ask the guy that made the ams zip - i have no knowledge of what modifications he has done to this rom. its an entirely different project thats based on this rom from an entirely different person. i do not support or encourage using that rom. I have tried the ams versions too. They seem very unstable compared to Arhtard's version. samsung released the source files finally... downloading now, lets see what i can come up with.. stay tuned. Thank you for your reply. I got my sd card to work and used your update.zip file. Everything installed fine then I went to link2sd and it says no sd card present again. There is no sd card available in the settings menu either. Do you know of a command for terminal that will mount the sd card. just curious, did you partition AND format your sd card? this sounds like its not formatted, i made the same mistake one time and ended with the exact same results as you're describing. Thanks. Each card until the last one had been formatted with the fat32 and ext2 partitions. I would try different paritition scenarios and nothing would make the sd card available. Twice I inserted new sd cards formatted in fat32 which were recognizable. Once I got it to recognize this latest card in fat32, I haven't tried partitioning it. Thanks for the help. if you partition it in the wrong order it wont show as available or existing for that matter. its simple but tricky to partition it correctly - a small mistake will make it "not there"
i recommend trying it again, partition it, you'll like the link2sd feature, start with the fat 32 partition as PRIMARY and leaving 248 to 512 mb free then partition the 2nd partition ext 2 PRIMARY with whatever space is left. then format the fat32 partition if the program didnt for you. if you're into changing roms, i know you'll try it eventually, lol. Yeah. I will try again once I have a spare sd card. I can't mount the old cards even when formatted to fat32. This one works for now, so I am leaving as is. Keep us posted on new developments. Thanks. also, was wondering if anyone has flash working. are there settings i need to change for it to work?